Sarthi Chouhan could not complete her studies after 10th standard. But she had a strong urge to do something on her own and be independent. But she did not know what to do or where to go. When she learn about the professional courses at Livelihood College, she saw an opportunity there. She came to Jashpur Livelihood College and looked into various courses offered there. “I saw different courses and found that the course on Beauty & Wellness suits me the most. I knew nothing about Beauty & Wellness but it was interesting to me.” Sarthi says. She had come a long way from Raigarh, her home district, to Jashpur for doing the course. It was not a problem for her though as the Livelihood College is a fully residential college. The study materials are also provided free of cost to the students here. 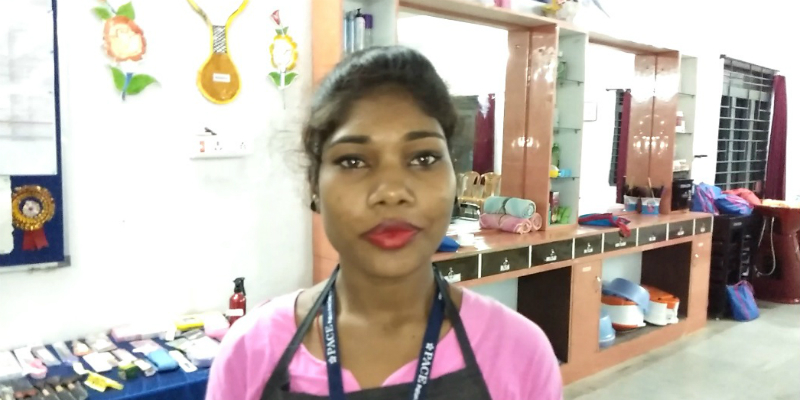 At the Livelihood College, Sarthi has learnt a lot of things related to the Beauty & Wellness Industry. She has learnt the trends and procedures adopted in the industry and also the most important aspect of the industry- hygiene. The completely professional training has enabled her to do conduct procedures like threading, manicure, pedicure etc. with efficiency and skill. She is now confident that she can manage any work in a beauty salon. But the most significant transformation she has undergone is the ability to speak in from of people. “I was very low on confidence. I am not even a matriculate and it has always been a source of nervousness and anxiety for me. I could not even talk to people let alone speaking in public. I would always prefer to remain silent and hide from people. But here, after doing this course I have learnt a lot and my confidence has grown significantly. I have also been taught how to speak in public or to communicate with people. Now I can handle any conversation. When I start working, I will be able to talk to the clients very well.” She says. Sarthi is eager to complete the course and start working. Her father is a laborer and mother is a housewife. Sarthi has two elder brothers. She hopes to be able to contribute to the family. Earning on her own and contributing to the family instead of being dependent on others is a great motivation for her to be sincere about the course. She is confident that she will get a good job after the course. The Livelihood College also offers placement assistance and this is a great relief for students like her. The Livelihood College is an initiative to turn Chhattisgarh into a hub of skilled manpower. Every district of the state has one Livelihood College. These colleges impart skill education to young men and women form various parts of the state. This initiative is in tune with Prime Minister Modi’s vision of turning India into a global supplier of skilled manpower. The Livelihood College, with its various courses is fulfilling that dream.